All proceeds of this one day sale go direct to the Foundation, a community based organisation providing accommodation, training, employment and community access services to adults with an intellectual disability. In addition, the Foundation plans to have the Emporium (including the existing Fabric Cave) open on Mondays and Fridays and the first Sunday of the month. The Foundation welcomes any donations of quilt and craft fabrics in good condition for resale. A chance to see a spectacular display of traditional quilts made by the members of Eastwood Patchwork Quilters, while visiting historic Brush Farm House, 19 Lawson St Eastwood . Brush Farm House(pictured) was built around 1820 by Gregory Blaxland, one of the first Europeans to find a route across the Blue Mountains. 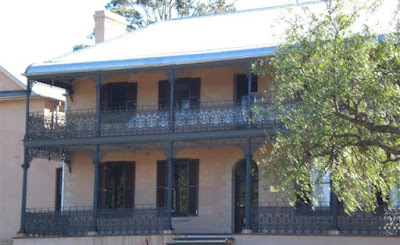 It is one of Australia’s oldest and substantial houses remaining from the Macquarie era. It has been, recently restored and renovated as an exhibition space by Ryde City Council. We will also use additional exhibition space in the adjacent Corrective Services Training facility. It's time to book your place at the Gala Dinner held as part of the Sydney Quilt Show 2008. Come along for great company and a sumptuous dinner as well as an interesting presentation from guest speakers Sarah Fielke and Kathy Doughty from Material Obsession. Award winning quiltmaker Kim McLean is this year's guest exhibitor at the Sydney Quilt Show. Seventeen of her stunning large quilts will be on display including two Sydney Best of Show quilts from the early 1990s, A Tisket A Tasket, Fill up Casey's Basket (1991) and Casey, Santa, the Beach, It must be Christmas (1992) together with Houston prize winners Hexagon Stars and, Turkish Tiles. Each of these four quilts has graced the cover of Quilters' Newsletter Magazine so viewers are in for a real treat. After a seven year quilting hiatus, Kim started making combined applique and pieced quilts again in the early 2000s. While her early quilts were made from reproduction fabrics, more recently Kim has been using contemporary fabrics. 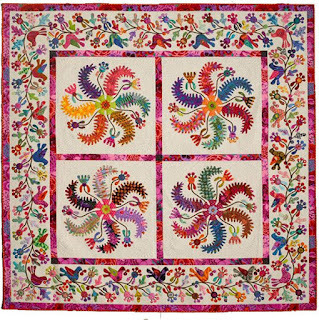 Princess Feathers (pictured) features bright Kaffe Fassett fabrics is a masterful example of a modern quilt made in keeping with the spirit of antique quilts. Be sure to come and look at the quilts in person. 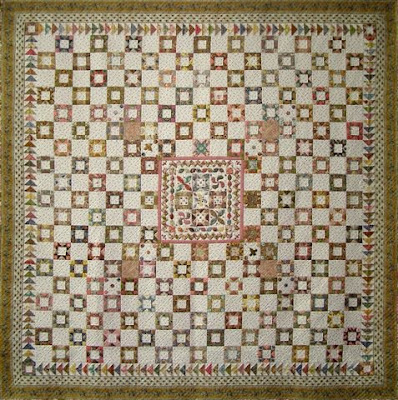 See the Guild Website for details of other feature displays at the Sydney Quilt Show 2008. Shoal Bay Rd, Nelson Bay. $5 entry to opening only, admission free of charge at all other times. 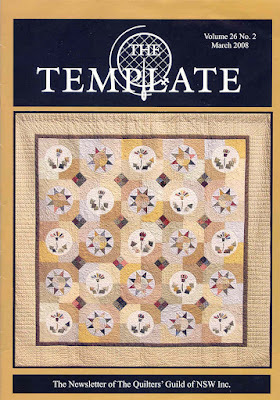 The cover of the March newsletter, The Template, features the fabulous Guild raffle quilt for 2008. Tuesday's Folly was made by The Piecemakers group from Earlwood. Raffle tickets were distributed with the March newsletter but you can always purchase more from the Guild office or at the Sydney Quilt Show. 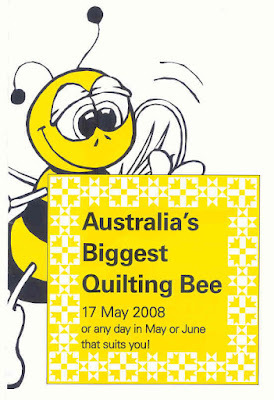 The Quilters' Guild of NSW Inc invites you to participate in a national quilting event and take part in Australia's Biggest Quilting Bee on Saturday 17 May 2008 (or any other date in May or June that suits you). For every $50 raised, fill in a lucky ticket and return to your ABQB Representative by 30 June 2008 to win fabulous prizes sponsored by Singer, XLN, Mini Jumbuk and Australian Homespun. For more information, download this brochure (237KB) or contact NSW ABQB Representative Margaret Stephenson (Tel: 02 9771 3189). Lovely quilts, traders stalls, tea, coffe, lunch, a prize-winning raffle quilt, craft stall just in time for Mothers' Day. Raffle proceeds will go to Hornsby Ku-ringai Mental Health Association.